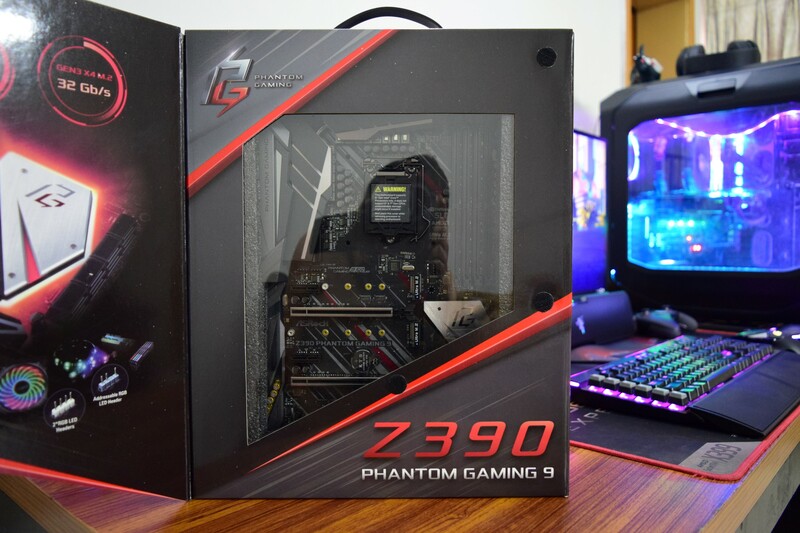 The Phantom Gaming 9 comes in the standard ASRock packaging with easy carry design. The front is themed in red and silver which is now officially part of the Phantom Gaming lineup. 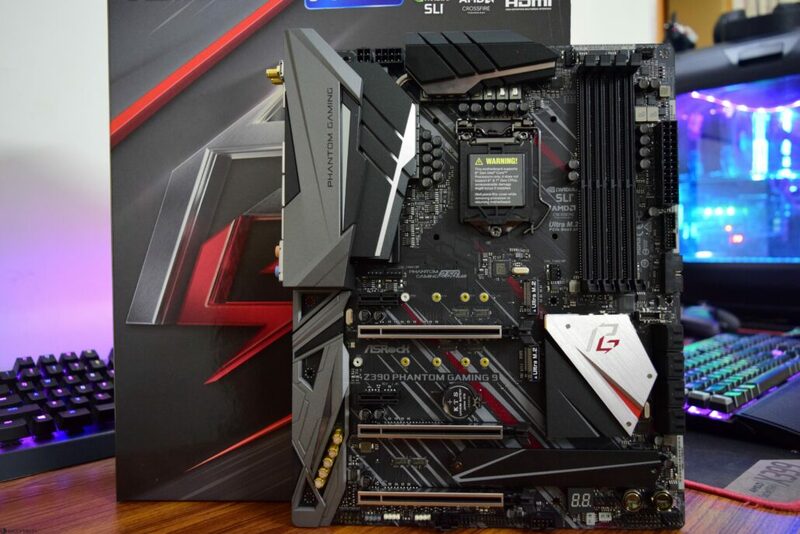 You can also note ASRock Phantom Gaming “PG” logo for their new motherboards on the front which looks great. The front side also lists down support for Intel’s 9th generation Core processors. There’s also support for Intel Optane memory along with Polychrome Sync, NVIDIA SLI, AMD Crossfire technology (although AMD has abandoned the Crossfire name and uses mGPU instead nowadays) and HDMI support mentioned. 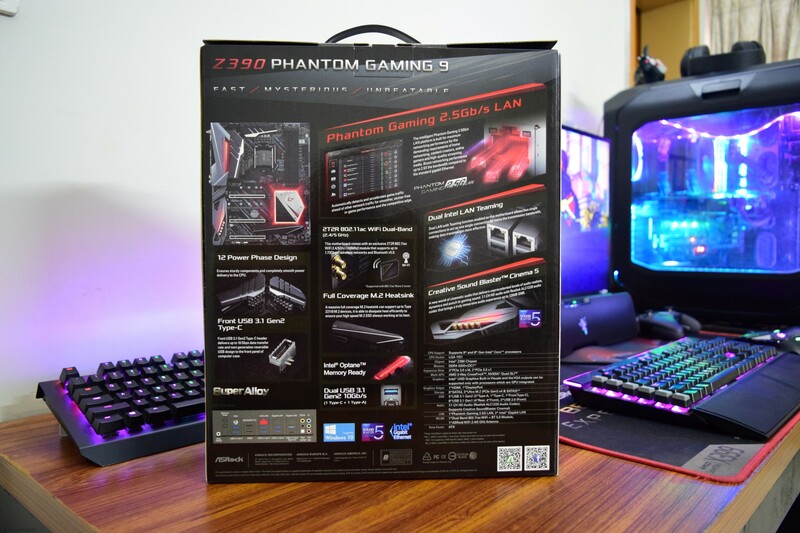 The back side of the package lists down the specifications and special features of the motherboard such as 2.5 Gb/s Ethernet, 12 Phase Power Design, 2T2R 802.11ac WiFi (Dual-Band) 2.5/5 GHz, Full coverage M.2 heatsink, Triple M.2 slots and other features mentioned. The front side also comes with a full cover which gives us another preview of the feature set that the motherboard has to offer. 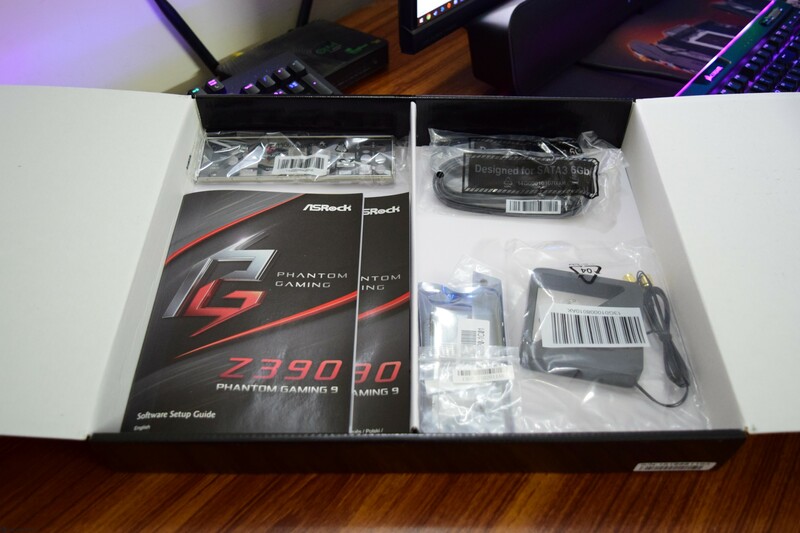 Inside the package is another box which contains the accessories in the top and motherboard at the bottom. It is very easy to access although the accessories are a bit scattered and things could get messy sorting out the various additions. There are several accessories included in the package such as a Wi-Fi antenna module, four SATA III cables, an I/O cover, screws for the M.2 storage devices, a high-bandwidth SLI bridge, a driver disk, a manual for the board and a post card. Following is the full list of accessories in the package. 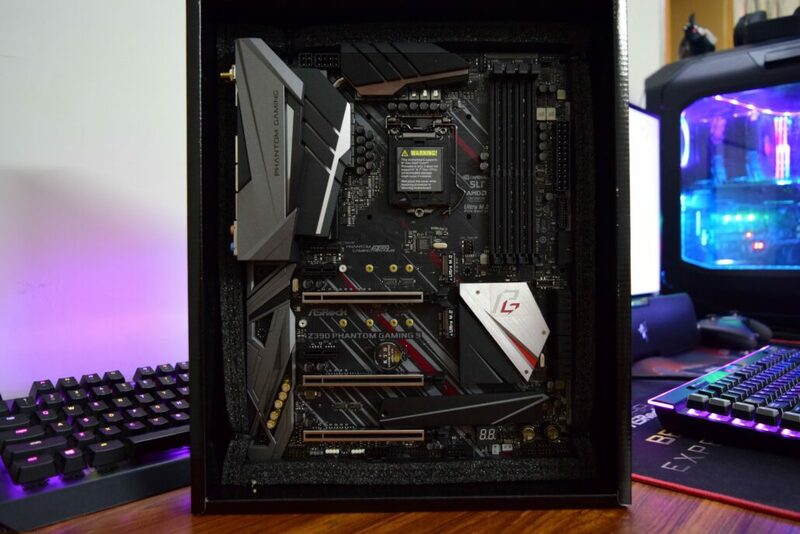 The motherboard is housed underneath the accessories and has the anti-static wrapping to protect it from any built up electrical resistance that can affect the board. 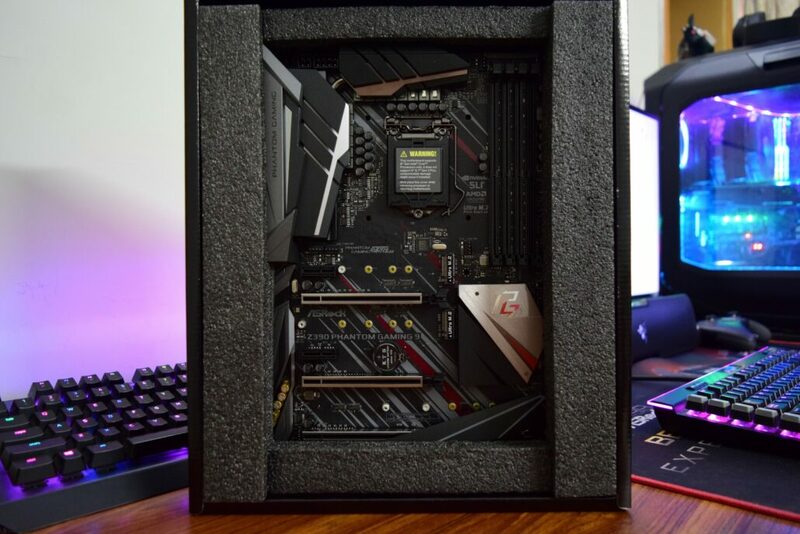 The motherboard is housed on the top section, over the accessories and has a soft foam cover to protect it during shipping. 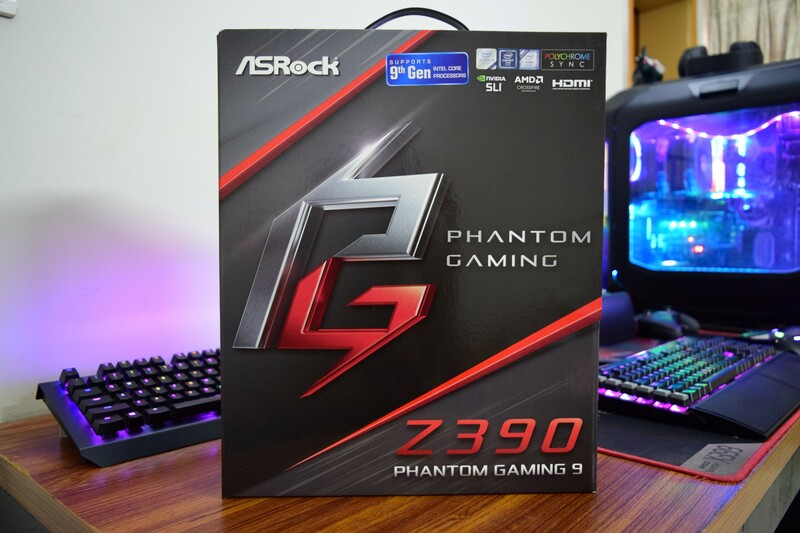 The ASRock Z390 Phantom Gaming 9 has a very aggressive design scheme that screams high-end. It doesn’t have as much glitter splattered all over like some other boards that focus more on the RGB trend nowadays but it’s impressive in its own right, using professional design scheme that looks really well built. One more thing I noticed is that the design scheme is very similar to the Taichi Ultimate and I’ll talk more about that in a bit. Looks are one thing but I am very curious to find out how this performs against the other Z390 boards we have tested in the past few weeks.